When I first got to know about child sponsorship in 2012, the charitable cause was a really abstract idea to me. I didn't know of anyone who had sponsored a child and wondered if the money contributed would really go towards improving the life of my sponsored child. It was a great privilege to be able to work with World Vision Singapore earlier this year as part of Wee Kim Wee School of Communication and Information's study programme. We visited several parts of Lijiang, Yunnan in China to gather news and strategically communicate that information at an exhibition. Child sponsorship is something I hold dearly, and unlike a one-off donation, it takes great commitment. My first involvement in child sponsorship was with a little girl in India. 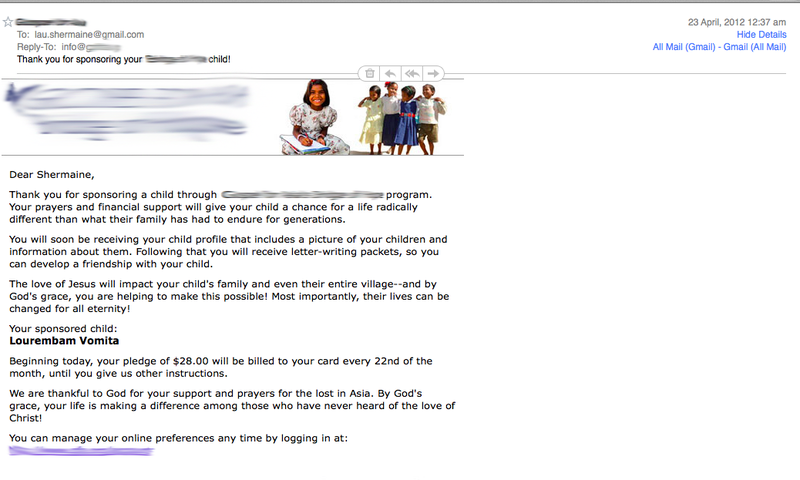 Below is an e-mail I had received from the child sponsorship organisation (NOT World Vision). , Alas, I decided to withdraw from this child sponsorship after six months as I began to grow suspicious of the way in which the funds were used. The organisation was based in the United States and I found it really hard to get it to be accountable for the funds. On top of that, I felt it was overly focused on Gospel sharing and that there was a bias — it seemed to unfairly favour Christian kids. I had never received a single letter from my child, and the organisation sent me lots of promotional materials asking me to contribute much more (without me ever really seeing the results of the contributions)! However, World Vision is different because it does not favour any particular religion and non-Christians can also join the organisation. I was really excited when I heard my school was partnering World Vision Singapore for the trip to Yongsheng in Lijiang, Yunnan Province. The draw of child sponsorship has never left me — but I must say it is indeed a serious, long-term commitment. Chickens roaming freely amidst laundry left out in the sun. A farmer surveying her crops. I was appalled to see houseflies resting on food, and that it was left out in the open for hours, only to be consumed later. Food hygiene and safety is certainly not a priority around these parts. A typical family dining table. Most of the villages we visited had water shortage issues. They are located in the mountains because crops used to flourish there, but climate change has drastically changed the livelihood of these villagers. Moving to other, more fertile lands is difficult due to their lack of money, and some of them carry litres upon litres of water up the mountains each day (making several trips). There are no paved roads and the journey is extremely dangerous — falling stones or slippery roads could kill them when it rains (though rain is very rare now). Most of the time, we experienced a significant language barrier with the villagers as they spoke a native dialect. One of the translators we met (below) was from a nearby village. He had the chance to live in the city only because he excelled in school, but felt obligated to return to his friends and family in the village to help them out as best as he could. The villagers' modes of subsistence are severely limited - no farms to tend to because of water shortages, and no land to plough as it is really barren. Given the harsh conditions, child sponsorship is undoubtedly a welcome relief to them. I was really surprised to hear that the sponsorship funds do not only go directly to the child, but also help develop the village in which he lives. For example, it enables technological solutions, such as large dams or pipes from nearby mountains where water is abundant, to be implemented. I have a lot more to say about my child sponsorship journey, and intend to share more in subsequent posts. If the idea of child sponsorship has piqued your interest, visit this website for more details! Stay tuned for further updates. These images are copyrighted and are taken by the author of this blog. Please do not copy, edit, crop or alter them. Feel free to share the post with your network.